They say it’s possible to have too much of a good thing. That’s definitely the case with some things, like ice cream. You’re going to have to take our word on that one. The good news is that after seeing V9 Collective twice in a short space of time, we don’t feel like we’ve overdone it. 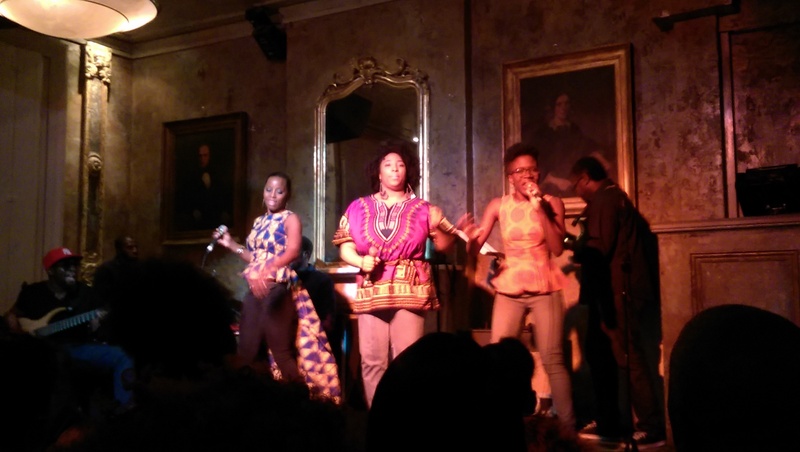 The group headlined the latest Close Up event at the Old Queens Head in North London last night. It came on the heels of the Premier Unsigned Live event, which took place over the Bank Holiday weekend in Balham. Both were great but it was last night where they really tore it up. V9 Collective is a group that excels when they’re performing live. And it’s in intimate venues like these where they’re able to connect with the audience. We’ve been to some humongous shows this year but this is different. When you create an atmosphere like you’re able to create at this type of show, you just wish you could bottle it and keep it. Where Unsigned Live and Close Up differed is in the type of show and the composition of the band. Last night, the cajón was replaced with a full drum kit and the keyboardist also came out to play. The full band allowed them to go full throttle. The audience was more than appreciative. Each of the vocals shone, each vocalist told a story and each musician left us awestruck. Especially the bassist. He smashed it. It all served to whet our appetites for the forthcoming album. If these most recent shows are anything to go by, we’ve got a lot to look forward to. Five Star ***** review. Very nicely written and every word believable. V9 Collective – so gutted I missed them but by this review so assured that they lived up to expectation and more….